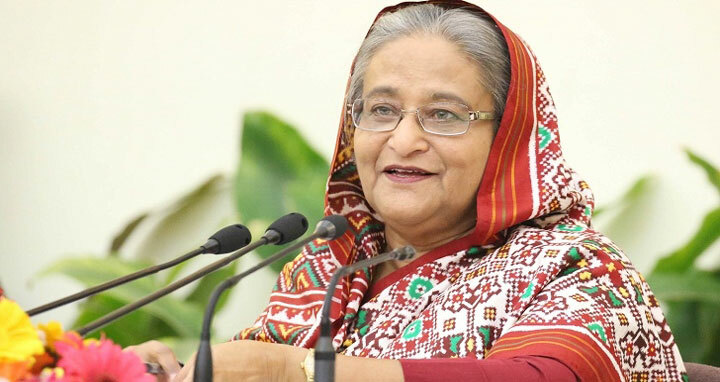 Dhaka, 15 April, Abnews: Prime Minister Sheikh Hasina urged the countrymen to stay alert so that no evil force against the country's heritage, language and culture as well as the very existence, can come to power. "We have to always remember the words of Bangabandhu.....we are Bangali, Bangladesh is our country and Bangla is my language.... so we have to remain careful so that no evil force against the spirit can come to power again," she said. Sheikh Hasina was exchanging greetings of Bangla Naboborsho-1425 form her party leaders and workers at her official residence Ganabhaban here yesterday. Extending her Nabobarsho greetings to every Bangali people at home and abroad, the Prime Minister expressed her optimism that Bangla new year will usher new hope and inspiration among people. Bangla Naboborsho is the new year for every people of Bengali nation irrespective of their religion, caste and creed. It's the only national festival which is celebrated by every Muslim, Hindu, Christian and Buddhist with equal enthusiasm and spirit both in urban and rural areas as well as abroad, she said. The Bangla Naboborsho is also featured with traditional business activities of the Bangali people as they open new account books (halkhata) of their businesses on the day, closing the old one. The government has taken measures to give a festival bonus to public and private sector employees to help them financially to celebrate the festival, she said. "But, unfortunately a section of people try to cast a religious shroud on it, and they can do this as they have no affection or love for Bangla language and Bangali people," she said. Pointing out the long run conspiracy against Bangali culture and values the Prime Minister said the Pakistani rulers as well many rulers following Bangabandhu's killing tried to prevent Bangali people from celebrating Bangla Nabobarsho. In this regard, the Prime Minister gave an example of BNP government's bid in 1993 to bar celebrating Bangla Naboborsho-1400 saying they (BNP government) had tried to prevent Bangalis but couldn't. "They could not suppressed indomitable Bangalis as the nation under the auspices of a national committee headed by poet Sufia Kamal welcomed 1400 Sal and welcomed new century of Bangali calendar overcoming all barriers," she said. "Rabindranath Tagore and Kazi Nazrul also welcomed Bengali year 1400 in their life wishing prosperousness of Bangali nation. But, BNP could not understand their languages," she said. "Such conduct would have must ashamed Rabindranath if he was alive," she said. The Prime Minister said Bangladesh is the only country in the subcontinent where every people speaks and thinks in one single language. People of this country have achieved everything including liberation, rights of language and cultural practice through long struggle, she said. Sheikh Hasina said Bangabandhu was assassinated at a time when he was taking forward the country through rebuilding the war ravaged economy and infrastructure. After his assassination the rulers propagated a distorted history of the country, destroyed the spirit of the liberation war and anti liberation forces were set on the helm of state power. The war criminals and killers of Bangabandhu were rehabilitated, trying to take Bangladesh to completely opposite direction to the purpose for which it was liberated. Central leaders of Bangladesh Awami League lead by General Secretary Obaidul Quader greeted the Prime Minister with a bouquet of flowers. Samyobadi Dal leader Dilip Barua on behalf of his party and 14-party combine greeted the Prime Minister. Leaders of Dhaka South and North units of Awami League, Mohila Awami League, mayor of Dhaka South City Corporation, leaders of Jubo League, Sramik League, Krishak League, Swechhasevak League, Jubo Mohila League, Bangladesh Chhantra League, Bangabandhu Ainjibi Parishad, Krishibid Institute and Bangladesh Medical Association also greeted the Prime Minister. Officials of the Prime Minister Office led by Principal Secretary Md. Nozibur Rahman greeted the Prime Minister with bunch of flowers.